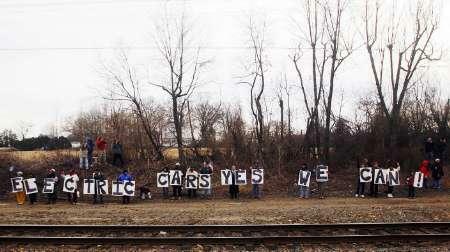 People hold signs reading "Electric Cars Yes We Can" for U.S. President-elect Barack Obama as his train passes enroute to Baltimore, Maryland January 17, 2009 on their whistle stop train trip to Washington DC. More on electric cars and Linc-Volt love. Thanks Thrasher! The one thing that wasn't told by Reuters is that all those folks were singing the new Neil Young song "Get behind the wheel" for Barack Obama while they were showing him their LincVolt love. That's cool, isn't it? as much as the opinions wax and wane about the new material i think it will at least go over like living with war. now, if it is produced well, like greendale, then it will probably make a nice, warm, listenable album. not a classic, but surely not bad. Can anyone verify whether the first comment is serious or a joke? The "Fork in the Road" album is produced by The Volume Dealers (NY and Niko Bolas). Same producers as Chrome Dreams 2. The new album will be a very good one! "Fork In The Road", "Cough Up The Bucks", "Light A Candle" and "Get Around" are wonderful tunes. The rest of the material is simply the funkiest material he has ever written. And we are not used to this kind of songwriting from NY. That's our problem. At least it is a problem for those fans not looking for change in any form. Ha, ha, Thrasher, that was me having fun in a good mood. Sorry, it's a joke. Wish it was true! That should be a real good joke. anybody seen and video/news footage of these folks by the tracks? Maybe with the train going by? Please post if you have a link. You guys can keep praising Neil for "moving forward", etc. And you can keep dismissing the critics as "complainers" who are harping on the negative. For me, I'm just sick of the mediocrity, and now the slip into awfulness. I've given Neil every benefit of the doubt over the years. I've bought all the new albums. But, I've got news for you: Nobody besides us small group of hard-core fans has given a darn about a Neil Young album since maybe Silver and Gold and probably not since Mirror Ball. Since Briggs died, it's been one misstep after the next, highlighted by Are You Passionate, Greendale, Prairie Wind, and now this monstrosity. These albums may become listenable after the 28th listen, but the non-fanatic dismisses them as slight and boring. It didn't used to be this way. Neil Young used to be great. Great. When was the last time there was any consensus that Neil Young released a "great" album. Ragged Glory? He used to be great, and that is why we like him today and still follow his output. But let's not pretend that this stuff is something it's not. At some point, you have to ask the objective observer what this music really is. Believe me, the objective observer will tell you that it is plain bad. You have repeated that a hundred times now, Big Rig. Pity for you. Don't buy the records, and find yourself another hero that won't dissapoint you. Neil has earned the right to do what ever he feels is rockin'. As a live act he totally rocks !! It was a joke? It's not nice to fool Mother Nature. But you gotta love those people for making the statement, right? I mean, just singing a song won't change the world, right? Singing a song makes all the difference. To sleepy children in need of parental comfort. To the millions of people who marched on Washington with MLK, Jr.
For some of us, it's Neil's songs that continues to link us to our destiny where hope, love, and change fill the airwaves. If you want to make a difference for me and your fellow human beans. Before LincVolt makes it's historic trek to DC, why don't we give our favorite college sponsored radio station a call to remind them of the dates so when LV is passing through, they can play some cruising music? Music that will inspire, transform, and motivate listeners to become better stewards of this beautiful planet we share. Often times, environmental safeguarding like what Neil has been doing go ignored when it hits the newswire, but if we call or write, maybe LincVolt will get the truly deserved publicity it needs to make an even greater impact creating an awareness about choosing lifestyles without further harming the air, water, and soil. Where else but to start at the colleges and university radio stations that are not locked into pre-programming and commercials? To begin, find a mapmaking search engine that will locate "colleges & universities" along I-70. Next, locate the radio station address and call letters. Begin there.